Spend the summer learning science at PTMSC! Campers will engage in exciting classes, labs and field programs including: sieving through sediments looking for brittle stars, pulling a seine net through eel grass beds to learn about local fish and using microscopes to observe plankton! 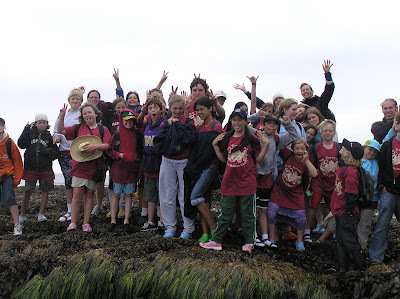 This day camp that gives youth the opportunity to learn about individual groups of marine plants and animals while learning to connect them to their ecosystem as a whole. In addition to the activities described for day campers, this overnight camp allows youth to explore other marine ecosystems on the Olympic Peninsula! While being immersed in marine themes, hands-on labs and creative projects, campers will enjoy the unique expanded learning environment that only a residential camp can provide! Campers will stay in the dormitories located Fort Worden State Park and will be supervised by their marine instructors. This day camp will allow campers to spend the week exploring the varied natural environments from beach and glacial bluffs to the local forest, pond and meadows. 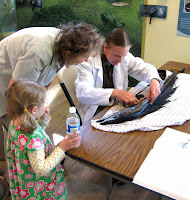 Explorers in this camp will assemble skeletons of marine mammals, catch and study bugs, learn about earthquakes, investigate pond life and make connections between fossil animals and their descendants alive today. Click here to learn more specifics about each camp, to download a registration form and/or to inquire about costs. We hope you decide to spend the summer learning about marine and coastal science with us! Please join us on Saturday, June 20th to celebrate the beginning of summer! All festivities will be FREE to the public and should prove to be fun for all ages. While exploring both exhibits families can decorate cookies and get their faces painted! At 4pm you can sit back and relax in our Natural History Exhibit while listening to a lecture on Tsunamis presented by Chris Moore from NOAA. We encourage all of you to join us....as many of you have probably not visited for a few years! Come see what has changed here at the Marine Science Center since you last visited. 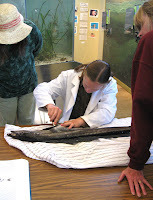 In late March a Longnose Lancetfish (Alepisaurus ferox) washed ashore in Fort Worden State Park. Cheqa, our high school intern, set about documenting and studying this fish. Above is the video he took of the fish after placing it in one of our holding tanks. We are not sure why this normally deep water fish washed ashore, though at the time it was clear it had already suffered severe skin lacerations and was in poor health. Sadly the Lancetfish did not make it through the night. Cheqa lovingly referred to the Lancetfish as "the fish of a lifetime" and began packing the remains to be frozen until further use. Among the unidentifiable items in the stomach we found: a couple feathers, a piece of kelp, part of a fish skeleton and a couple pieces of plastic. This provides further evidence of the harm plastic is having on our marine environment.